AutoFill by Priority Group means that the helpers you designate as Group 1 will be assigned to their preferred schedules first (up to their maximum hours per week with one shift per day), and after that is completed, the Group 2 helpers will be assigned to the remaining shifts, then Group 3, etc. 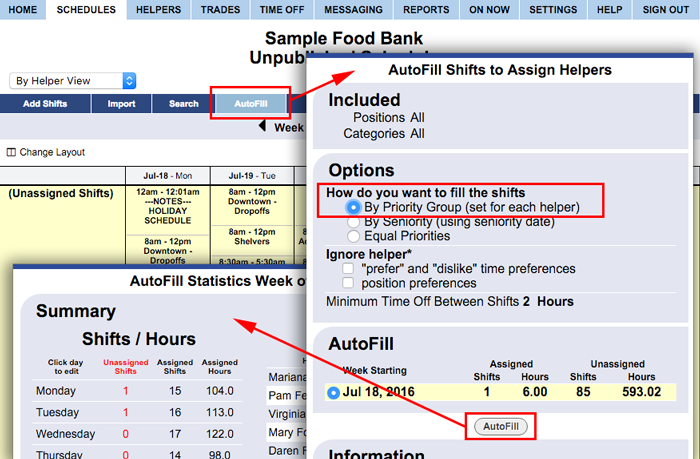 If after all Groups have been considered, there are still shifts remaining and helpers available, AutoFill will run the entire process again to assign the rest of your shifts. This is all accomplished in a matter of seconds. With Priority Group scheduling, your helpers in higher priority groups can be given preferential schedule assignments. This will also help your full-time helpers to get their maximum hours per week.